I love lazy weekend mornings, staying in bed just because you can! As I lazed around one Saturday morning trying to get the energy and motivation to start the weekend, I vaguely remember hearing a TV host talk to a guest about avocado key lime pie. “What a great idea,” I thought. I started to pay a bit more attention but then thought again, “I can always look this up online.” Wrong. I could not find that particular recipe anywhere. I remember at one point the guest added coconut oil to the mix. Once I pulled myself out of bed, I grabbed the laptop to find the recipe. Nothing matched my hazy, sleepy remembrance. I didn’t have any key limes anyway. 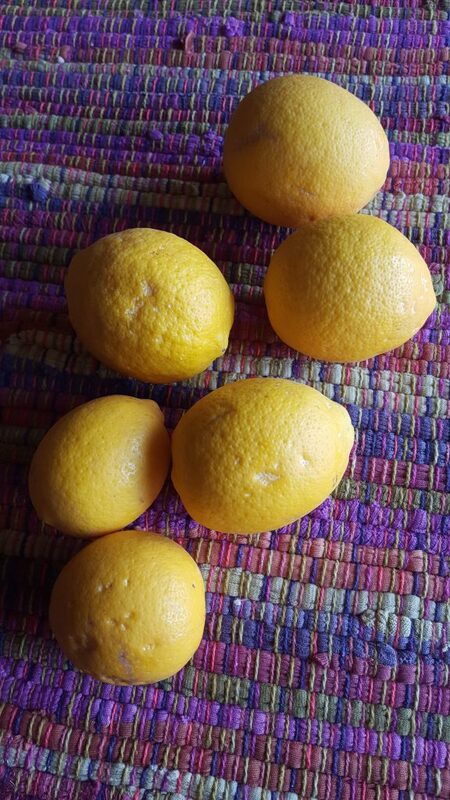 What I did have was the very last Meyer Lemons from our greenhouse tree. That decided it. I would make my own version with Meyer Lemons. In a large skillet, toast pine nuts until just aromatic. Cool. 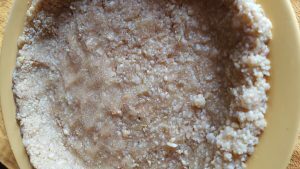 In a food processor, pulse nuts, butter (cut in chunks), sugar and salt. Using your fingers, gently press nut mixture into the bottom and sides of a 9″ pie plate. Bake 10 minutes and remove from oven to cool. While pie crust is cooling, make the filling. BUT, make sure your crust is totally cool before pouring in the filling. You’ve probably heard of Avocado Key Lime pie. Here’s my take with lemons. Because of the coloring of this pie, I am pretty darn sure you could pass it off as a key lime. It is tart and a dollop of whipped cream is probably needed I love the macadamia-pine nut crust and it’s nutty sweetness plays well with the pie filling. Sounds like a winner to me. If you can’t find a recipe, make it up yourself! Good job. Meter lemons have such a great flavor — this is a really creative use for them! I suppose you could also use a regular crumb crust for this. I’d love it. 1 cup of pine nuts!!! That crust must taste really amazing. I used to make an avocado pie all the time … I totally forgot about it. I bet this is good with lemons. Actually I have never heard of an avocado key lime pie! Sounds interesting, but, being a Key Lime Pie LOVER, I might find adding avocado almost a sacrilege. 🙂 Still envious of your Meyer lemon tree and you pie does look yummy. Great call on the crust! This is so very unique and inspiring. Great job Debra! We love nutty crusts — so much flavor. They’re a pleasure to eat And I LOVE lemons. Obsessed lemon freak here. 🙂 Neat recipe — thanks. 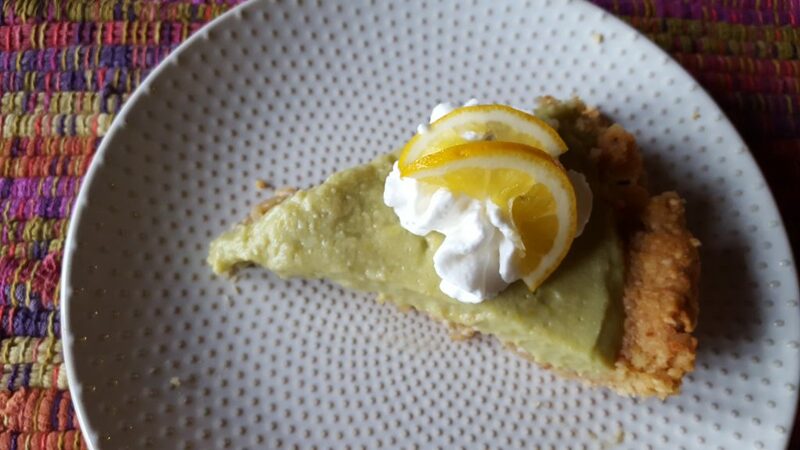 Wow, avocado key lime pie, brilliant and so glad you made your own recipe. Rare you do NOT find an answer online. And what a decadent crust. 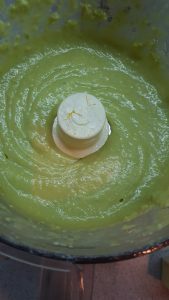 I will admire this Avocado key lime pie from afar, its really splendid and admire that you used your own Meyer lemons from the greenhouse.